THIS vessel is representative of the most up-to-date practice in steam trawler design. The ship, which is named White Pioneer, was built in 1935 in Aberdeen and engined on the Tyne. She operates generally from the port of North Shields. The White Pioneer is typical of most modern propulsion ideas. She has a White patent steam engine, incorporating a compound steam reciprocating unit, i.e. two successive expansions and a reaction turbine. Both of these engines are geared to a single shaft. The machinery takes steam from a single coal-fired Scotch boiler, the bunkers being at the sides of the boiler room. The ship has a length between perpendiculars of 125 ft. 6 in., a beam of 23 ft. 4 in. and a depth of 13 ft. 6 in. Her gross tonnage is 270, and her net tonnage 118. She develops 500 i.h.p., when the engine turns the propeller at 110 revolutions. On trial this trawler reached a speed of 13½ knots. She is the first trawler to be fitted with this type of engine, and is suitable either for the North Sea or Faroe Islands fishing grounds. Other features not generally to be found in craft of this type include the graceful cruiser stern and a special rudder of what is known as Balanced Reaction type behind the screw. This rudder cuts down the amount of power required for steering. The arrangement otherwise is quite typical of these handsome little craft. A large fish room with coal bunkers is placed forward of the machinery space. 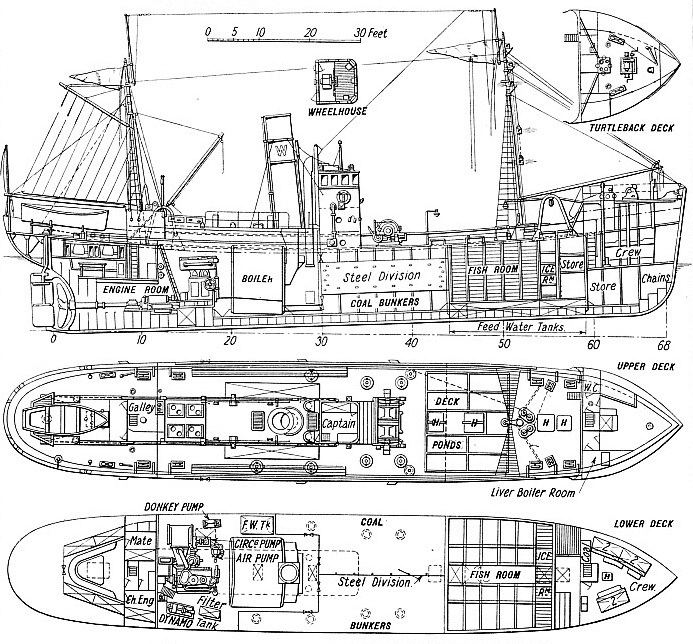 The mate and chief engineer are berthed aft - where there is a comfortable saloon - and the crew space is forward. The wheel-house is fitted forward of the tall funnel, with its two mechanical boilers and ventilators. The steam trawl winch is placed forward of the bridge, and a small boat is arranged on chocks at the aft end of the main deck. For heavy weather purposes the vessel has a a short forecastle. You can read more on “The Fishery Patrol Ship”, “Fishery Protection” and “The Harvest of the Deep” on this website.